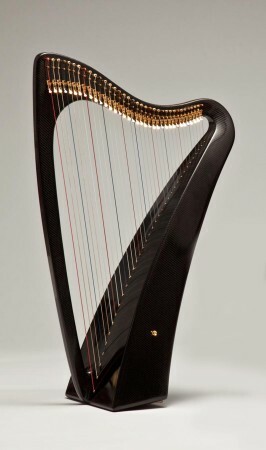 This harp has a full 36-string range, from C to C, with concert spacing and great string tension. It features a curved soundbox and an extendable leg to rest on the floor when sitting or standing. The leg is stored inside the harp, and held in place by a clamp. At only 42 inches tall and 8 pounds (fully levered), this harp highly-portable, and thrives in situations that would destroy a traditional wood harp. The harp has a depth and power of tone that belies the size and weight.